One of the most valuable aspects offered by Project 2013 has traditionally been its ability to recalculate task schedules when you change the project start date or a change to one task’s schedule affects one or more dependent (linked) tasks. This powerful behavior saves the project manager — you — from having to rethink and reenter dates to rescheduled tasks throughout the project. But flip sides to the benefits of automation always exist, and in the case of project scheduling, automatic scheduling can lead to unwanted schedule changes based on software behavior and not on human expertise. 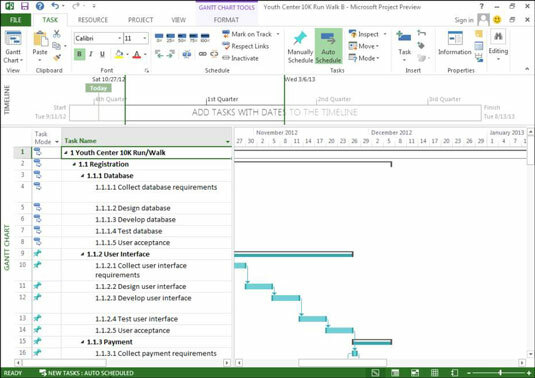 To retain the helpful aspects of automation that make scheduling less time-consuming while allowing project managers to retain schedule control when needed, Project 2013 allows user-controlled scheduling. Auto Schedule: Project calculates task schedules for you based on the project start date and finish date, task dependencies, calendar selections, and resource scheduling. Manually: Project enables you to skip entering the duration and dates, and specifying them later. When you enter the duration and dates, Project fixes the schedule for the task and doesn’t move it unless you do so manually. The manually scheduled tasks move if you reschedule the entire project, in most cases. The Gantt bars for manually scheduled tasks also differ in appearance from those for automatically scheduled tasks. The indicator for auto-scheduled and manually scheduled tasks is at the bottom of the Project window. The project file can have all manually scheduled tasks or all auto-scheduled tasks — or any mix of the two. By default, all tasks that you create use the manually scheduled mode. For the overall project: To change the mode for all new tasks, select the Task tab, click Mode in the Tasks group, and then choose Auto Schedule or Manually Schedule from the menu. Any individual task: To change the task mode of an individual new task or a task that you’ve previously entered into the schedule, click the Task tab on the Ribbon and then click either Manually Schedule or Auto Schedule in the Schedule group. Or, in the sheet, click the Task Mode cell for the task, click the drop-down arrow that appears, and click either Manually Scheduled or Auto Scheduled in the drop-down list. You need to balance the desires of your inner control freak versus the need to be an efficient project manager in determining how often to use manual scheduling. Though manual scheduling prevents Project from moving tasks that you want to stay put in the schedule, you may need to edit the schedules for dozens of dependent tasks in a long or complicated project. The best balance — particularly for beginning project managers — may be to use manual scheduling sparingly.